Anyone that has ever used a computer has accidentally deleted something from it, or at the very least they’ve experienced a moment when something happens (usually referred to as a WT…H (what the heck) moment, a moment in which they realize that suddenly all or some of their files are gone. Whether deliberate, accidental or for who knows what reason, files get deleted, and sometimes you need them back. Especially if they were personal to you or business related. 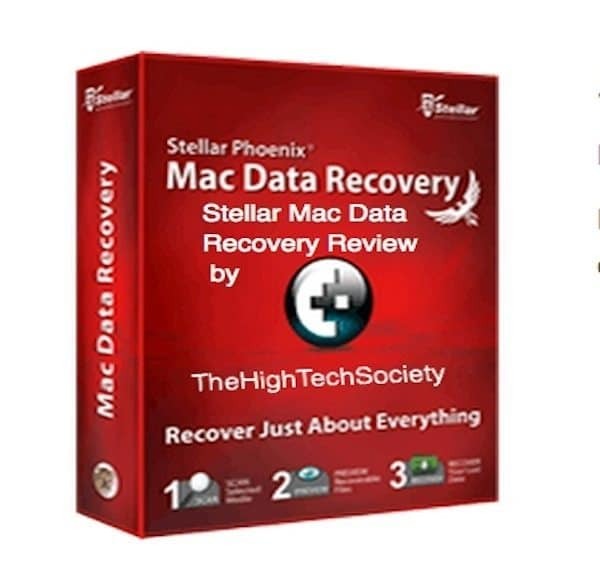 Stellar Mac Data Recovery claims that it can get them back for you, so I am reviewing their software to see how if it can live up to its claims of recovering lost data from my Mac. 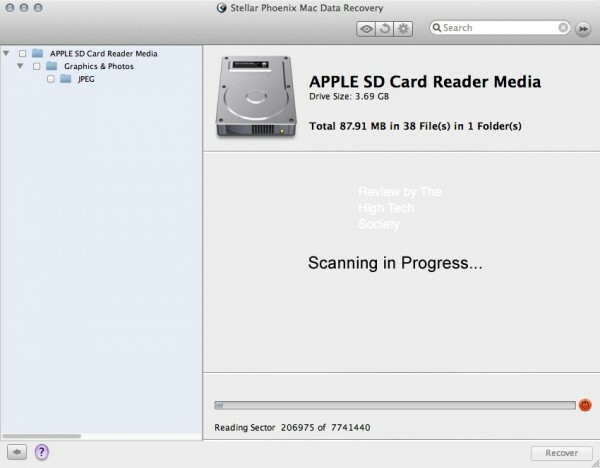 My story: It was about 6 months ago and I was doing a software review on a product for Macs. I was very hesitant on doing this review, as it wasn’t something Mac’s really need, sadly though I wasn’t also cautious or smart. What did I do wrong? I did not backup my Mac, and yes, I know how stupid that was and I have paid the consequences in the resulting loss of photos (my son’s wedding pictures) I so loved and some documents I dearly needed. 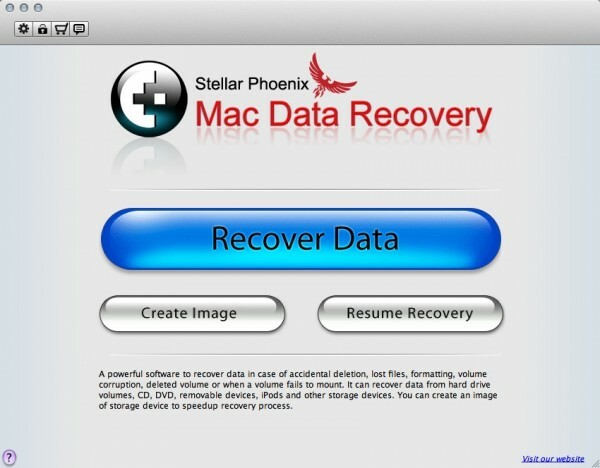 Now it is time that I try to recover those files and photos that I lost by using Stellar Phoenix Mac Data Recovery, I will let you know how the software worked as I use it. So, get ready, cause here we go! Install was easy as most programs are and was problem free. 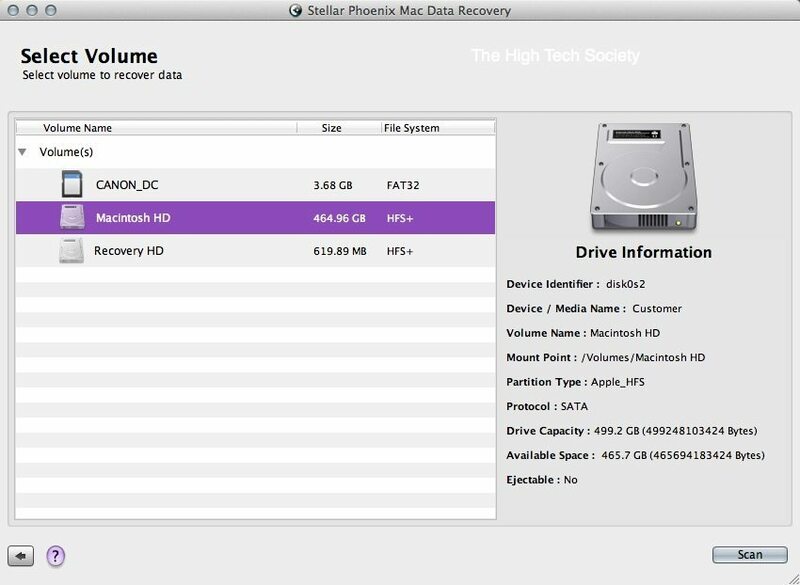 The Stellar Mac Data Recovery interface is also nice, as it is laid out in a way that helps you to know what to do without ever having to go to the tutorial. 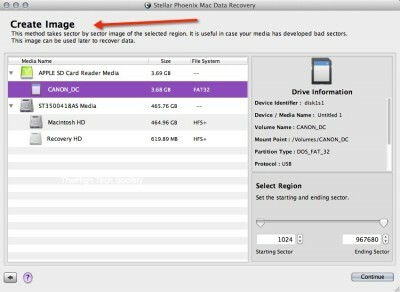 Once it starts you are first presented with 3 options: Recover Data, Create Image or Resume Recovery. 1) Recover Data, this is just what it sounds like, it takes you to recover what you lost. From there you have many options to choose from. At the top there’s Drive Recovery, Photo Recovery, CD/DVD Recovery, iPod Recovery, and Raw Recovery. In the center you have Quick Recovery, Deleted Recovery, Formatted Media / Lost File Recovery and Search Lost / Deleted Volumes. Clicking on any of these will take you to a screen asking you which volume or device you want to recover your data from, except for iPod Recovery which of course the device is already selected so now you just click on which recovery method you wish to use. If at any time you have more questions though on what to do, there is a help button (a question mark symbol) in the lower left corner of each window. 2) Create Image allows you to take a sector by sector image of the drive you select, which is useful for you later if the drive ever develops bad sectors. 3) Resume Recovery is also what it sounds like, it’s what you want to choose if you want to resume a scan you saved earlier. This is especially good to use when you have done a scan, recovered some files, and then need to search multiple files for the one you want. You can preview them each, which is great, but it just takes time if you have many to look through, especially if you don’t know the file name. It’s nice to be able to save it and come back later (aka resume recovery) to get the data when you have more time. Quick Recovery: Like the rest of their tags or names on their options, this is also just what it sounds like. It’s a quick recovery process and the first one you usually pick if you think that finding the files you lost may not be that hard to find. 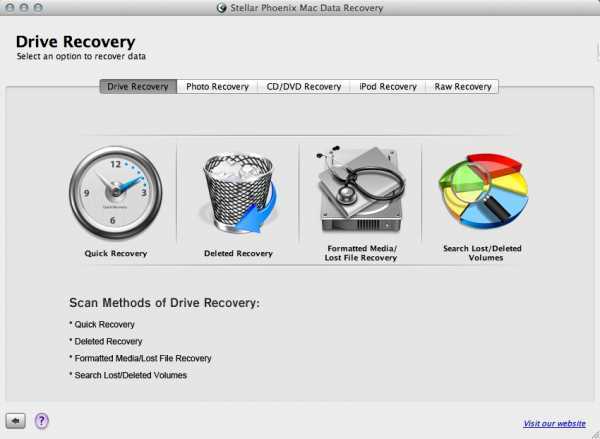 It’s not as long as some of the other recovery processes, thus the name quick recovery, however, it may not find all of the files you need so if it doesn’t work you will have to try another one of the options. 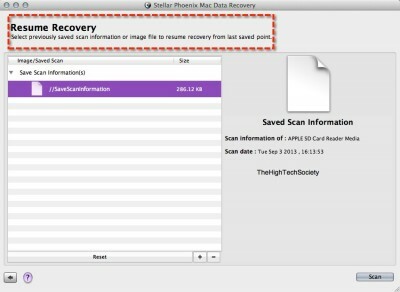 Deleted Recovery: You can click on Deleted Recovery if you have accidentally deleted your files. This one is not a long scan and finds any files you deleted by accident pretty quickly. 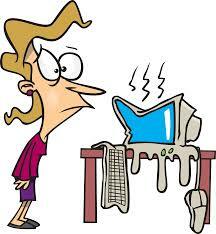 Formatted Data Recovery: This is the one you use when you know you’re in trouble. I needed it for my MacBook Pro which I had to reformat when I had downloaded that darn defrag for Mac program that completely screwed up my computer. I thought the information was lost forever, and that review for that software, well let’s just say they didn’t get a good review. It was, however, my fault for not backing up, as I admitted earlier, and they did tell me in the software that they recommended you backup your files, but most say that and I ignored it. Halfway through the defrag process the computer just locked itself up and then it just got worse from there causing me to have to start over from scratch. Search Lost and Deleted Volumes: This option may have been of help when I first had issues with my MacBook Pro and lost my ability to get the Mac to boot (volume to mount). Choose this one if you have a similar issue. Other Settings: You can also tweak your scan settings to fine tune the search. You can choose file extensions, or even by camera. 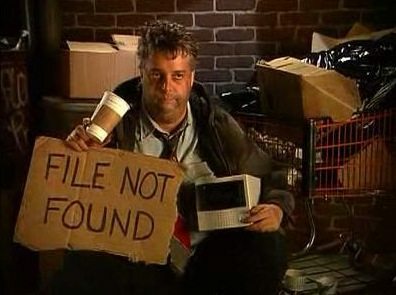 You recall my story, I was dumb and didn’t backup my Mac and lost everything that was on it as a result of a bad software program. After looking through the Stellar Data Recovery program I could see what I needed to do. Starting with those first 3 options, I picked Recovery. Once there you are also given more options as to what you wish to recover or from where you want to recover it from (you can see more of that above in my Features & Options section). For my first scan I clicked on Photo Recovery, since missing photos were really what I wanted most. I then picked a volume to scan, for the first scan I choose my SD card, and later scanned my hard drive. In less than 5 minutes, the program had scanned my iMac and found 641 deleted photos and videos. But, which ones do I want and which did I delete on purpose? Fortunately you can double click on the file to get a quick look at the image or video. 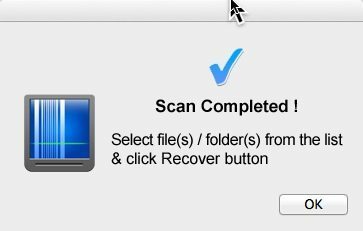 Once the scan is done, you can then click on the ones you want and click Recover. There’s also a handy back button in the bottom left corner, which I liked as it made it much easier to navigate through the program if I found that I stumbled into the wrong area. My husband and daughter at my son’s wedding, a picture I am happy to have recovered! I noticed while previewing some of them that they were corrupted, but there weren’t many of them like that. I was just happy to get most of them back in one piece, so that didn’t bother me that a few couldn’t be put back together again. If you don’t have time to sit and go through each image you can save your scan for later. 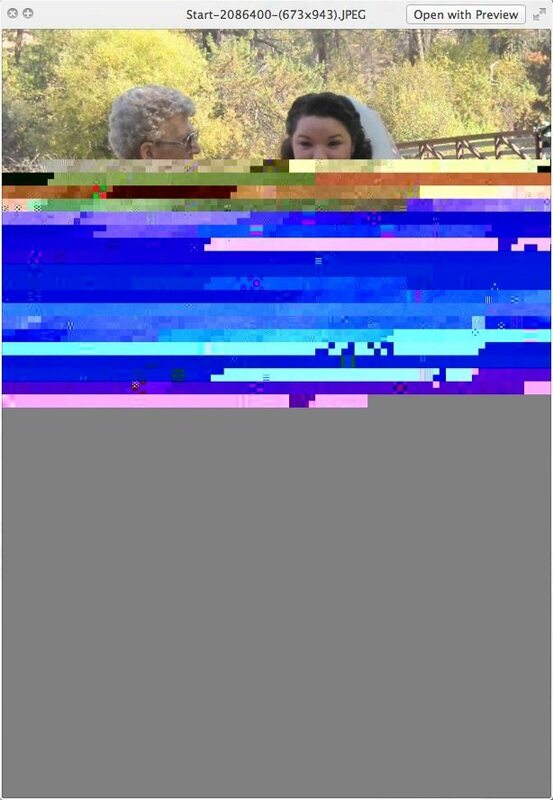 I did use other programs to attempt to recover this data, sadly none of them worked. This one, Stellar Data Recovery, did work though! It takes a long time to scan as it is going volume by volume, but it found all of what I had lost some 6 months ago, even after I had reformatted the drive. I was and am really amazed by it, and of course thrilled to have my files back. I always try to find some pros and cons with every software I review. With this one the pros are that it worked, it was very easy to use, and I am thrilled to no end to be able to have all of my files and photos back. 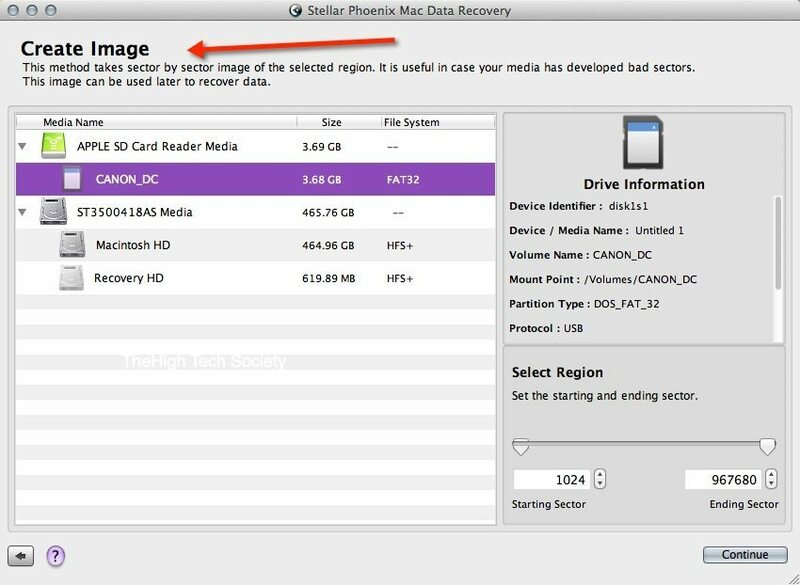 I also like that you can also get data recovered from your Boot Camp partition, and that you can recover deleted files with their original file names, which makes recovering them so much easier. The cons, one thing that some may not like is that you have to put your password in each time the program restarts, but this makes sense as you are making changes to your computer and when you do that your password is required. It doesn’t bother me, I view it as another layer of security and a reminder to be careful. Another con for some may be price, as it costs $99, however, they often have promotions going on, and you have to consider if it’s worth that amount to you to get your files back. 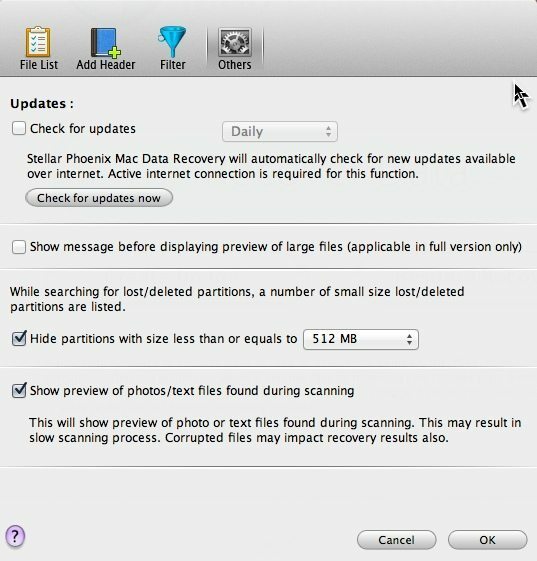 If you would like to try Stellar Data Recovery for Mac, you can click on it below to start a free trial. I would love to hear your stories about why you are using this software. Tell us too if you like it, and whether or not it was able to recover your data like it was able to do for me. writing i am too delighted to share my familiarity here with friends. Hi Kim, thanks for the detailed information. I have only one question, if I can recover the files to the same hard drive? If I had a Mac I would use this software to recover my data.